Perazzi is an Italian manufacturer specialising in precision shotguns for hunting and sporting. They are recognisable for their removable triggers and can be used by shooters of any expertise - from entry-level to advanced. Guntrader holds a comprehensive selection of Perazzi shotguns for sale in the UK. Browse our collection of new and second hand shotguns today or simply come here to trade in your used shotguns. Our team of gun experts constantly search for new arms to add to our collection, ensuring we are the leading online marketplace for weaponry. Left handed, complete with adjustable comb and recoil pad. Upgraded wood and makers case. No 2 of a pair of Perazzi MX8 Game gun's, both of these game gun's are numbered 1+2 in gold inlay and are supplied with original makers double case. No 1 of a pair of Perazzi MX8 Game guns both numbered 1 + 2 in gold inlay! Manufactured in 2002, both these fine quality game guns are in very good condition and are supplied with a double makers case. Perazzi MX8 Sporter offered at great value and comes complete with Teague Precision Long Thin Wall multi chokes (x5), spare part set, Perazzi manuals and makers case. Nice, relatively dark, SC2 wood. Bore dimensions are 18.5 in both barrels, good for fibre wads. This is a well looked after gun with nice wood, the gun is very tight, and was recently had Teague chokes fitted. is has very few age related marks. MX3C Perazzi Sporter, Multichoke in good condition. 2015 Perazzi MX2000S, SC2 wood in lovely condition. Recently serviced. Fixed chokes at 3/8 & 5/8. Slight rubbing of the action due to the wool lining in it's gun slip. Easily re-blackened at approx £250. MX8 SC3 Sporting game scene engraved with highly figured stock and forend, Kick-Eez recoil pad, 11x7mm flat taper top rib with half vented side ribs, detachable trigger with barrel selector and Perazzi ABS case and spares kit. MX2000 with MX8 removable trigger unit. This gun has SC2 wood and is in truly immaculate condition having had minimal use. WE CAN TRANSFER FROM DEALER TO DEALER. Lovely MX12 100 Scroll SC3, new and unfired. SC3 straight - grained woodwork with 35mm/50mm drop and 4mm/8mm right hand cast. Perazzi leather covered pad. Barrels are 1560gms, choked three quarters and full with a 7mm parallel rib. THE TOP OF THE LINE COMPETITION GUN . 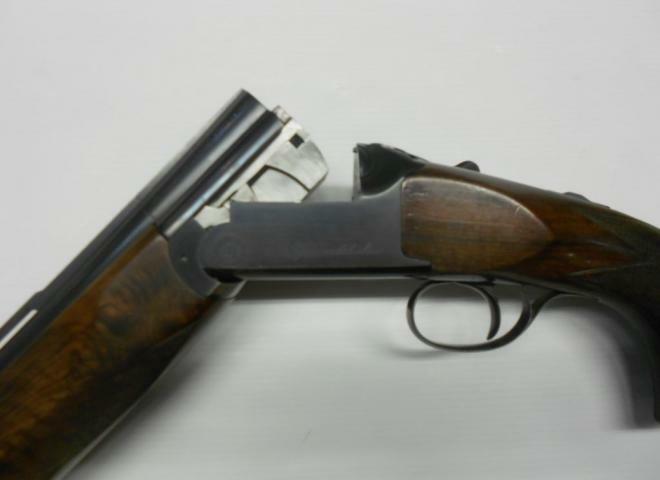 Pre owned MX2 Perazzi with slightly stepped rib. Unmarked and in superb condition I have only used this gun twice. The gun is like new in feel and looks the action is the same tight like new. We are delighted to have this 12 Bore Perazzi MX2000S over and under fixed choke sporter available at the factory in Italy ready for stocking now! MX2000S PRO PLUS IN EXCELLENT CONDITION !! RIB 11 - 7 10mm STEPPED.PART EXCHANGES ARE WELCOME. MX2000S MADE IN 2012, GUN IS IN EXCELLENT CONDITION !! This is a 2018 gun that shows very little signs of use. With all the usual attributes from Perazzi (as used by George Digweed). Cased. A Perazzi MX8. This gun comes in makers original case and with spare chokes. 32" barrels and a 14 1/4" stock. In absolutely superb condition, this gun has barely been used an ideal step into the world of perazzi. Exceptional Perazzi MX2000 George Digweed Special. 32" barrels fixed chokes 1/2 and 1/2. Adjustable buttpad. If interested call for further details. The Gun Room offers you the opportunity to purchase a, second hand Perazzi High Tech Sporter with 30" barrels, fixed choked 1/2 and 3/4, well figured timber in very nice condition, comes cased. AS new condition with a beautiful SC2 wood upgrade, 11x7mm flat taper rib, half vented side ribs, English style pistol grip and slim forend, will make a superb high pheasant gun or sporting clays, cased with all paperwork. Perazzi MX3C with 27" multichoke barrels with 2 3/4" chambers. Nicely figured 14 5/8" stock. Black actin with detachable trigger plate. In makers case with spare chokes & stock key. In good condition. The Gun Room offers you the opportunity to purchase a second hand Perazzi Grand Italia Trap with 29 1/2" barrels choked full and multi. Barrel Weight 1530. With tapered stepped rib, and adjustable stock. In good condition. THE SUPERB HIGH TECH SPORTER BLACK ACTION, THE NEWEST ADDITION TO THE PERAZZI FAMILY, LOVELY BIT OF WOOD ON THIS ONE! COMPLETE WITH ABS TRAVEL CASE. A TRULY STUNNING PAIR OF PERAZZI SIDEPLATES WITH (335) SCROLL ENGRAVING,HAND SELECTED WOODWORK. COMPLETE IN DOUBLE LEATHER CASE . AUTO SAFETY FITTED. Drop 1 3/16" - 1 1/2"
Excellent Condition, Sport With Makers ABS Case, SC2 Wood and Selective Trigger. FINANCE AVAILABLE, Please Phone (01526 354505) or Email for more details. as brand new with SC3 wood stunning handling in 33"
EXCELLENT CONDITION. DATED 2014 BUT SOLD NEW IN 2016. UPGRADED TO A STUNNING PIECE OF SC2 WOOD & CONVERTED TO BRILEY THIN WALLED CHOKES. CASED WITH 4 FLUSH CHOKES AND KEY. The Gun Room offers you the opportunity to purchase a second hand Perazzi High Tech with 31.5" barrels choked 3/4 and full. Barrel weight 1550. In good condition, great saving on new. Comes cased with Perazzi original spares kit.